EJ24's feature a smaller diameter 3rd, 4th and 5th string than our traditional EJ17 Medium set. These strings are for players that looking for a more balanced sound and tension across their medium setup. In addition, these gauges are optimal for DADGAD tuning, originally popularized as an alternative tuning in Celtic music, but extends into contemporary folk, fingerstyle and rock styles. 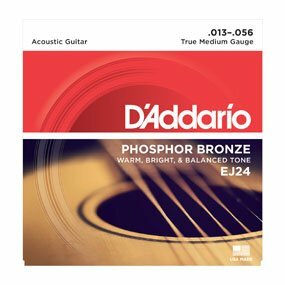 Phosphor Bronze was introduced to string making by D'Addario in 1974 and has become synonymous with warm, bright, and well balanced acoustic tone. D'Addario Phosphor Bronze strings are precision wound with corrosion resistant phosphor bronze onto a carefully drawn, hexagonally shaped, high carbon steel core. The result is long lasting, bright sounding tone with excellent intonation.